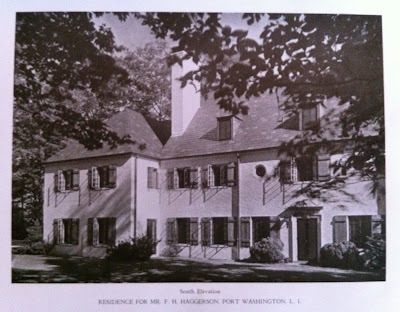 The Frederic H. Haggerson estate designed by James O'Connor c. 1920 in Plandome. Haggerson was the chairman of the boards of Union Carbide, Carbon Corp. and Electric Furnace Products. Click HERE to see the Haggerson estate on google earth and HERE on bing. Photo from Selections From the Work of James O'Connor. totally amazing. Probably cost the people more to buy this place, tear it down, build a new generic, than it would have to just repair this one, and they'd have wound up with something infinitely better. Me again. Wrong. The McMansion replaces some other doubtless attractive old house. The Haggerson house survives three houses over, across Madonia Court. Verification word 'musnt', as in musnt post comments before I'm thoroughly done checking things out. Thanks for pointing out my location error. It's rather hard to see on Bing with all those trees. Good looking house, glad it's still there; but did they have to whittle the land around it down to a residential lot? There's even a house wedged in between this one & the draw to the east. Not wrapping Madonia Court around this house on two sides & putting in that cul de sac so one more house could be added would have made a world of difference site-wise. Wow, what dramatic shadows those casement windows cast! Beautiful house. Thanks for posting. Haggerson was my grandfather's cousin. According to Nassau County, NY gov records, the home was completed in 1929. This is probably accurate as opposed to c.1920, since it would have been unlikely Haggerson would have moved into an estate like this at only 36 years of age in 1920, and also having worked at Union Carbide for only one year, since 1919. Also, Jesse Ricks, a Carbide head before Haggerson, did not finish his Plandome estate until 1927.